Let me start off by saying there’s two unique things about this soap. One would be it’s packaging; this must have been the most miss understood packaging in retail history. I think some wet shavers had mistakenly pointed out it’s subpar construction without really knowing it’s true purpose and two, the soap is made with Donkey Milk a very uncommon ingredient. 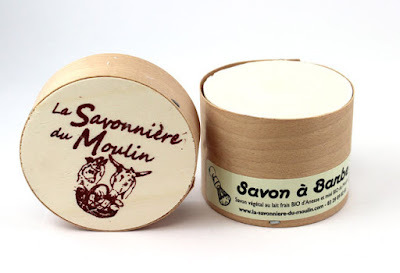 If you ever had a rubber band plane as a child, then you know what the tub of La Savonniere Du Moulin is made of its a very light balsam type wood. This wood is so thin it could bend and this is how the vessel was constructed for this soap using staples to keep it all together. Also placed in the bottom of each tub was a luffa sponge to rise the soap off the bottom. All of this was done to help the soap completely dry. The scent on La Savonniere Du Moulin is a light cologne which does increase slightly when loading your brush but still remains on the light side but very pleasant. The way the mill describes this product is as follows: organic honey, organic propolis, flowers from my garden Good, fresh organic milk from my donkeys that I milk myself everyday, and lots of love. This puck is the hardiest soap I’ve ever come a cross. I needed to submerge this in hot water for about 5 min and was able to use the loose layers in the captain’s choice bowl. I loaded my brush with adding water as needed creating a thick creamy lather that was off the charts. The coverage was fantastic allowing me to go over spots with my R89 Grand several times without applying more lather although my brush could have been used two to three more times with the lather that was left over. The slickness and glide was present throughout the entire shave. So I had a great shave with La Savonniere Du Moulin. If you like a light scented soaps, then I would recommend this one for sure. 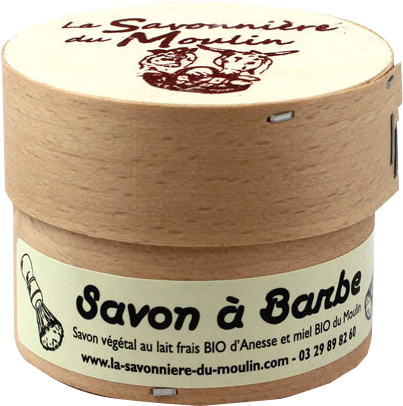 The best part of this product is the slickness and glide along with a great post shave feel. Some would say because of it’s high price it’s not worth the purchase but in retrospect I’ve used soaps that cost less with poor results. May I suggest a visit to the website they have a tool that allows you to read the site in English if you can’t read French. Wet The Face Dec Giveaway Going On Now!